Â· “Cranial osteopathy – aligning the plates of the skull.” Sounds great. Maybe I can use it to treat my hangovers. The Times certainly likes it, and it even got Dr Toby Murcott to tell us how it works in a box, alongside a case study, called “What’s the evidence?” Toby says: “Can cranial osteopathy treat the brain? Cranial osteopathy is a gentle technique – practitioners claim to feel a subtle pulse in the fluid surrounding the brain. There is some research to suggest that these pulses are related to slow, regular changes in blood pressure in the brain. This has yet to gain wide acceptance and it’s not clear how working with these might lead to health improvements.” Here’s what you need to know. Â· First, cranial osteopaths don’t even think the pulses are blood pressure; their theories revolve around the “inherent rhythmic motility” of the brain and spinal cord, mixed with breath and cardiac cycles, causing rhythmic fluctuation of the brain and surrounding fluid, which they think they can feel through the bones of your skull, and fix up with a bit of wiggling. They write long articles about actin and myosin (the things in muscle cells that make them move) being present in brain cells; unfortunately, they always forget to mention that brain cells lack the dense arrays of those filaments which are necessary to generate any significant movement. Â· But are there real “cranial pulses” to be felt, however they may be generated? It’s easy to find out: ask a couple of cranial osteopaths to write down the frequency of the pulses on the same person’s skull, and then see if they give the same answer. There have been five papers published doing just this, and in none of them did the osteopaths give similar answers. Which suggests to me that (a) this is not a reliable biological phenomenon, and (b) perhaps these cranial osteopaths are, er, imagining it. So: the discipline is based on a misunderstanding, they can’t measure what they claim to measure and work with, and there’s no evidence to say it works. Â· When I see a box labelled “What’s the evidence?” next to a health article by a Dr Toby Murcott, call me naive, but I assume he’s a medical doctor, rather than a science journalist with a PhD. And by now, regular readers must be wondering how I’m going to crowbar Gillian McKeith into this column. Well, what do you know, Dr Toby Murcott was the “science adviser” on You Are What You Eat, the TV show that told us we should eat more dark leaves, because the chlorophyll would oxygenate our blood. Bravo. 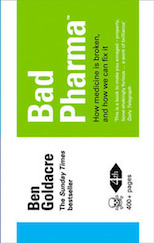 I don’t care what Ben Goldacre says (Bad science, September 23), after having severe sleeping problems for almost two years due to stress I was referred to an osteopath by my GP. I haven’t needed sleeping pills since (three months now). 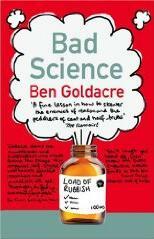 Bad science? Perhaps, but it worked for me. Â· I prostrate myself before you and admit defeat. I’ve been writing this column for nearly two years, and I still haven’t managed to stiff a single multinational cosmetics firm: they’re just too good at constructing legally defensible pseudoscience. I’m picturing huge laboratories and rows of scientists writing incomprehensible but legally sound babble onto their clipboards. Â· Cosmetics companies take laboratory data – stuff at a molecular level, the behaviour of cells in a glass dish – and then pretend it’s the same as the ultimate issue of whether something makes you look nice. This amino acid, they say, is crucial for collagen formation. Perfectly true, along with 19 others. No evidence to say that anyone is deficient in it, and, crucially, no explicit claim from the company that rubbing that actual amino acid on your face is what is going to make you look better. That link is made only in the customer’s mind: because the claim that the cream makes you look good is an entirely separate one, made for the cream as a whole, and it’s true, because all creams will hydrate your skin and make you look good. Vaseline, as it happens, also does it rather well, but leaves a greasy sheen. And most cosmetics research, since you ask, comes down to conserving the moisturising properties of Vaseline, but avoiding the greasiness. Diprobase, at less than Â£10 for a half-litre tub, represents a pretty good stab at solving this problem. Â· What about the other magic ingredients? One thing kind of works: cooked and broken-up protein (hydrolysed X-microprotein nutricomplexes, or whatever they’re calling them this month). These are long soggy chains of amino acids, which contract when they dry, and so temporarily contract your wrinkles. That’s temporarily. And all the expensive creams have got that in them anyway. A couple of other things kind of work. Vitamin C, and alpha-hydroxy acids affect skin significantly, although only at such high concentrations that they also cause irritation, stinging, burning and redness: so now they have to be watered down, to pretty useless dilutions. But companies can still name them on the label, and wallow in the glory of their efficacy at higher potencies, because by law you don’t have to give the doses of your ingredients, only their ranked order. Â· Now, I’m begging you, find me one that makes a properly fraudulent pseudoscientific claim I can write about without getting sued, and I’ll give you a free tub of Diprobase.